The Walk: This walk is ideal for county top enthusiasts as it bags two of Wales thirteen county tops in a single walk. It also features a visit to a spectacular waterfall. Start the walk from the pay and display car park at Tan-y-pistyll to the county tops of Denbighshire and Montgomeryshire by following the signs to Pistyll Rhaeadr. It is an enchanting waterfall in the Berwyn Mountains and at 240ft high it is the tallest single drop waterfall in the United Kingdom. Once you have enjoyed the spectacle which you could leave until the end of the walk begin the climb to the county tops by following a track in a north-west direction up to Trum Felen. From the summit at 691m head further up on a course north to reach Moel Sych, the county top of Mongomeryshire. From here amble northwards for one kilometre across practically level high ground to Cadair Berwyn, county top of Denbighshire. Coincidentally both county tops reach the same height of 827m. 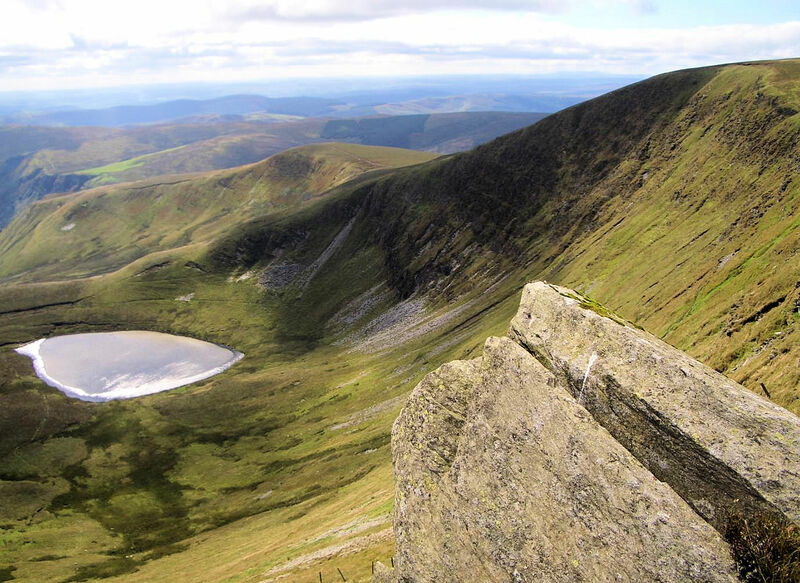 The only difference is that Moel Sych supports a cairn while Cadair Berwyn supports a trig pillar. After bagging the second county top return on the line you took between them back to the first but this time take the path leading south and turning east around the contour of Llyn Lluncaws which serves as the source of Nant y Llyn. Meet the watercourse just south of the lake and follow it downstream on a course due south back to the start. You have the option of sticking close to the stream and reaching a good track by sheepfolds or staying slightly higher and looking up at Cerrig Poethion on the left as you descend. Both paths merge near the finish. The Walk I Would Do: This walk has everything a good circular walk should. The popular waterfall at Pistyll Rhaeadr makes the beginning or end a delight. Whether I visited the waterfall before or after the climb would depend on two things. First the time of day as I would like to beat the crowds and secondly the weather conditions at the time. Thus, apart from when I chose to visit the waterfall I would do this walk as shown.